"The research area was limited to within a 70km radius of Melbourne CBD. The data collection period ran from July 2012 to July 2013. This was deliberately designed to capture inter-seasonal yield. In all, 15 households took part in the research and each participant contributed 12 weeks’ worth of data. The collective plot size was 1,096 square metres, with a total yield of 388.73 kg worth of fruits, vegetables, nuts, honey and meat. A total of 1,015 eggs were also recorded. The study found that backyard food production was capable of producing a great diversity of edibles from common kitchen garden herbs to less commonly cultivated fruits and vegetables, as well as less commercially available varieties like amaranth, apple cucumber, acorn squash, butter squash, babaco, cape gooseberry, edible canna, elderflower, gem squash, loganberry, nettle, oca, orache, purslane, rat-tailed radish, viola flower, warrigal green, white mulberry and yacon. In total, 101 different types of nuts, fruits and vegetables were generated during the study period." To read the more about of the results of her study the full article is available on the Permaculture Research Institute website. 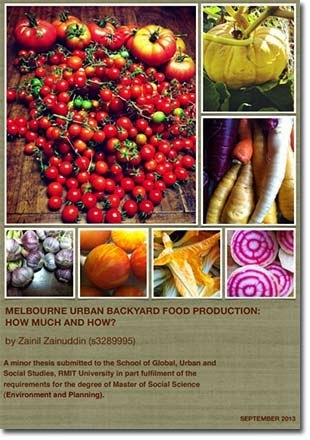 Zainil also writes the blog Urban food gardening, vegetarianism and sustainable actioning, for people interested in finding out more about her ongoing research into urban food production. She explains growing her own food "as our action and statement against the transnational food corporation monopolisation of the food we eat... It is also an attempt to reduce our food mileage to a small degree vis-a-vis peak oil. I wish more and more people would take up food gardening. It is doable and fun and very satisfying... By growing your own food and preparing your own food from scratch, you are taking back some control over the food you eat."